It may surprise you to know that there are more than 800 definitions for ‘forests and wooded areas’ in the world, according to a study carried out by Lund (2008). Some countries even have several definitions of forest in use at the same time. The many definitions have come about because the word has been used for different purposes and for different scales of operation. Thus, it may sound funny but it is true that a forest may not have any trees at all. This happens when land is zoned for administrative purposes which bear no relationship to vegetation. In this case, the land would be marked for use for agriculture, mining or urban areas. All other areas which do not fall into these three groups of land use would be marked as ‘forest’. As such, even though there are no trees on the land, it can be classified as a forest for administrative purposes. an area planted with similar trees. Even the definitions agreed upon for use by two of the most important international organizations for the word ‘forest’ are not exactly the same. The United Nations Framework Convention on Climate Change (UNFCCC) is an international treaty set up at the Rio Summit in 1992, for participating countries to co-operate to combat climate change and to limit average global temperature increases. The UNFCCC allows for the use of two definitions. For national greenhouse gas (GHG) reporting, forest is defined as per the country’s own definitions. For reporting to Kyoto Protocol, these countries have to follow a forest definition with the following parameters, namely, 10-30% minimum tree crown cover and the trees are able to reach a minimum height of 2 to 5 meters at maturity and occupying an area of 0.5 - 1.0 hectare. The latter definition of a forest is easy to use for aerial imagery to determine forest areas. In fact, aerial imagery is commonly used to estimate the extent of forest. It is also used to estimate the areas that have been deforested. The Food and Agricultural Organization of the United Nations (FAO) is the organization, which among its many activities, also assesses the world’s forest resource and reports it at intervals of five years. This report is known as the Global Forest Resources Assessments. The FAO has defined forest as land that has a minimum area of 0.5 hectare and with a tree crown cover of more than 10%. The trees should be able to reach a minimum height of 5 meters at maturity in situ. Urban parks, orchards, agro-forestry and other agricultural tree crop systems cannot be classified as forests for the assessment purposes even if they meet these criteria. 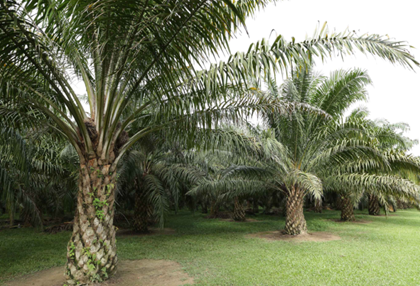 An oil palm estate is more than 0.5 hectare in size; the distinction of an estate from a smallholding is that the former must be 40 hectares or more in size. The crown cover is definitely in excess of 10% and oil palms are always taller than 5 meters when they are mature. Thus, following the definitions of UNFCCC and FAO, oil palm areas can be classified as forests. However, oil palm is excluded from being classified as a forest under FAO classification because it is an agricultural tree crop system. In Canada, the act of cutting plantation forest to harvest the wood is not considered as deforestation since the land will be reforested again to become a plantation forest. The cleared land is, thus, counted as a forest under the land use inventory. Cultivated oil palm fields are forests under UNFCCC definition. Thus, it would also be proper not to view the planting of oil palms on previous forested land as an act of deforestation. As a matter of fact, the oil palm trees remain on the ground for some 30 years before they are cut down and replanted. The oil palm trunks can then be used as lumber and to make furniture. During the fruit bearing stage when the oil palm is standing on the ground, only the fruit bunches are harvested to make into palm oil. This is similar to harvesting forest products. The oil palm is a forest plant that was growing wild in the jungles of tropical Africa before it was domesticated. A planted oil palm field is an agricultural crop system. Similarly, fields of planted soya, rapeseed and sunflower are all agricultural crop systems. It is improper to demand that agricultural crop systems must retain all the good attributes of a pristine forest, such as its immaculate high biodiversity and original capacity to sequester carbon dioxide. Yet, such demands are still being made. The primary source of oils and fats in the world comes from four main crops, namely oil palm, soya, rapeseed and sunflower. Among them, oil palm is the only oil crop that has the closest resemblance to the forest . This fact can be appreciated by looking at Figures 1 and 2. The oil palm is a perennial tree crop. Once planted in the field, it stays there for 25 to 30 years. It can remain in the field for more than 30 years but, in practice, it is cut down by the 30th year since it is too tall. It is not easy to reach the top of the tall tree and cut down the fruits. On the other hand, soya, rapeseed and sunflower are annuals. They fruit when they are a few months old. The fruits are harvested when they are ripe and the plants then wilt and die. Until the time when they are grown again or another crop is grown, the ground is left to nature and remains barren. This explains why a perennial crop such as oil palm can remove more carbon dioxide from the air and returns more oxygen than an annual crop such as soya, rapeseed and sunflower. The oil palm is standing in the field throughout the year and can carry out this function every day. As a result, oil palm has been shown to be able to remove 29.3 tonnes of carbon dioxide per hectare annually from the atmosphere . This is 8.3 times more than the amount removed by a hectare of soya which amounts to only 3.5 tonnes of carbon dioxide removal per hectare. These results are shown in Table 1. In return, oil palm refreshes the atmosphere with 21.3 tonnes of oxygen per hectare versus 2.56 tonnes per hectare for soya annually. 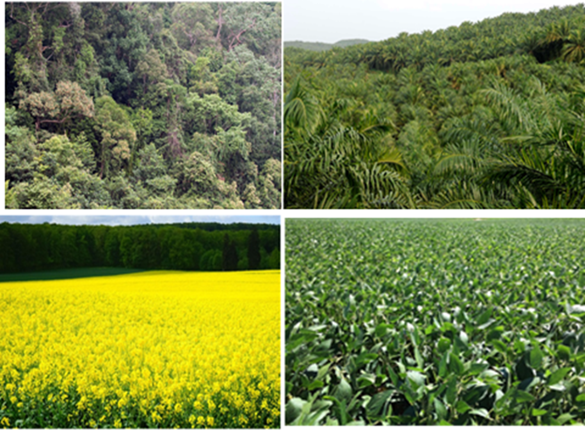 In addition, there are many other ways that the oil palm ecosystem is closest to a forest ecosystem than soya, rapeseed or sunflower ecosystems. These are shown in Table 2.
high carbon stock build up above and below ground. The oil palm ecosystem can be classified as a forest if the UNFCCC definition of forest is followed. However, some people prefer to use the FAO definition of forest whereby, oil palm, although being able to meet the physical definition of forest, is disqualified since it is an agricultural tree crop system. It is interesting to note that the total devastation or clearing of a pine forest plantation to obtain the timber does not affect its forest status classification. On the other hand, an oil palm plantation, despite its full canopy of tree cover and whereby only the fruits are harvested, is denied its forest status. Among the four principal oil crop agricultural systems, oil palm has the closest resemblance to the forest than soya, sunflower and rapeseed. The perennial nature of the oil palm enables it to resemble the forest closer than the other annual oil crops. Chan C.K. (2002), Oil palm carbon sequestration and carbon accounting: our global strength. MPOA Seminar 2002: R&D for competitive edge in the Malaysian oil palm industry, pp17. FAO (2015). Global Forest Resources Assessment 2015. GOFC-GOLD. (2009). Reducing greenhouse gas emissions from deforestation and degradation in developing countries: a sourcebook of methods and procedures for monitoring, measuring and reporting, GOFC-GOLD Report version COP14-2 (GOFC-GOLD Project Office, Natural Resources Canada, Alberta, Canada).